India Vs New Zealand – Can India fight back? New Zealand team is on a high. They have just knocked India off their perch and are sitting pretty in the series with a 2-0 lead. Their batting and bowling is doing great and they have the Indian team under pressure. The Indian team though has been struggling with both bat and ball. The only reason they came close in both the ODI’s is because of Virat Kohli and MS Dhoni being in great form. The bowling is a bigger concern. Except for Bhuvneshwar Kumar and Shami, Indian bowling has been really poor. They haven’t been able to keep the runs down nor have they been able to take wickets. Ishant Sharma has been really poor and India needs to drop him for sure. He has not been able to keep the lid on the scoring after good opening spells by Kumar and Shami. He hasn’t picked up wickets either. Varun Aaron finally might be able to get a look in. The spin bowling too needs a rethink from the Indian think tank. Ashwin hasn’t picked up any wickets over the last 2 months and he hasn’t been too economical either. It will be prudent on the part of the think tank to include either the seam bowling all-rounder Binny or replace Ashwin with Mishra. India has Rohit and Raina already who can bowl some good part-time spin if needed. It will be interesting to see if Dhoni does change the combination in this all important game. The opening also been a concern. 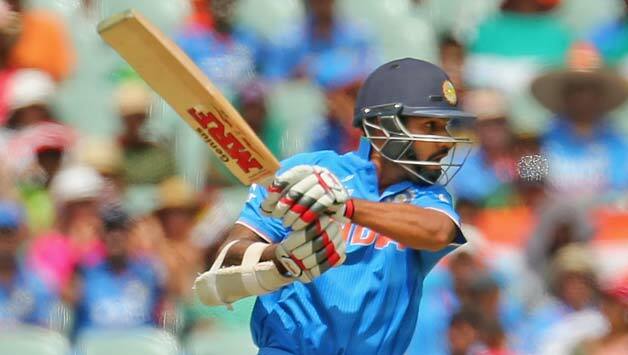 Dhawan and Rohit have been really slow at the top putting tremendous pressure on the middle order. Rohit has been really slow at the top of the order and he hasn’t been able to capitalize on the starts either. Rohit’s strike rate outside Asia is a poor 72.03 and his average also is a modest 35. India needs to make a decision whether to push the inform Rahane to open with Dhawan and pushing Rohit to the middle order. This is a crucial game for the Indian team and the think tank needs to make some harsh decisions. Dhoni has been really adamant with his team selections and it hasn’t worked out for him till now in the 5 overseas ODI’s. This is a must win game for the Indians and it will be interesting to see how the young players respond. The 2012 World T20 is just few days away and the Indian team once again enters the competition with lots of hopes. The team though hasn’t played a lot of international T20 this year and will have to make the most of the two warm up games ahead of the competition. India is about to play first of their two warm up games in few days and let us look at few of India’s main players in this year’s competition. There is no doubt that Virat Kohli is India’s best player this year across all formats. He has been in scintillating form throughout this year and will be the key for India’s progress in the world T20. Kohli would be hoping to carry on his good form into this competition and will be hoping to make an impact. It was interesting to see Virat opening the batting against New Zealand and it is unclear if that is what the Indian think tank has in mind for the world cup. Raina is probably India’s most experienced player in this format. Considering that he has played in all 5 IPL’s for Chennai Super Kings and hasn’t missed many games, he probably has played the most T20 games by an Indian. His explosive style of batting with his amazing fielding makes him a very important member in the T20 squad. He also has India’s only hundred in the International T20 and will be again a key member in the top order. Suresh Raina also provides Dhoni with an extra bowling option. His strike rate and Average in this format is excellent and he will be a huge impact player for India again in 2012 edition of World T20. Even though Harbhajan Singh hasn’t been seen in Indian colors for almost a year, he is expected to play a very important role in the world T20. Ravichandran Ashwin, who is a key component in the Indian ODI and test squads, surprisingly hasn’t done much in the 20 over format. Harbhajan who was part of India’s winning campaign in 2007 is still probably is India’s best spinner in this format. Harbhajan has the experience and his economy rate of 6.44 is brilliant over 20 games. Harbhajan seemed to be getting back to form in his last few games in county cricket and the warm up games will give us more information about his form. Harbhajan will be an important member in the Indian team and I expect him to play most of the games in this tournament. Even though Zaheer’s T20 record is nothing to write home about, he is still India’s premier bowler with the new ball. Zaheer’s presence in the team is for sure a great advantage for the Indian team. He is brilliant with the new ball and the Sri Lankan pitches help bowlers who can swing the new ball. He can be handful bowling under lights and India would be hoping for some early wickets from him. The return of Irfan to the Indian team earlier this year was a welcome relief. Irfan has been brilliant with both bat and ball since his comeback. He has got his swing back and has been bowling with decent pace. He was just involved in a series in Sri Lanka and the experience would help him a great deal. He has also been striking the ball beautifully with the bat making him the vital member of the team. He will be sharing the new ball with Zaheer and will for sure cause a lot of problems for the batsmen with his late swing. Yuvraj Singh can be called as the superman of cricket. When last year the news broke out about his cancer people were worried about his career. The man though has great heart and the way he has made a speedy recovery shows his dedication and courage. Even though people called the selection of Yuvraj as an emotional one, his presence in the T20 team is a huge bonus. He batted without much match practice against New Zealand and scored a brilliant 36 and it seemed like he had never been away from the team. He also gives Dhoni an option with the ball and also is a fantastic in-fielder. You cannot go wrong with selecting Yuvraj in any short format and he will be India’s trump card in this tournament. Gambhir was India’s premier batsman in 2007 victorious campaign. Gambhir has been struggling for form recently in all formats. He along with Sehwag has struggled to provide good starts at the top of the order. India would hope that both the openers come back to form in the T20 world cup. Everyone knows Gambhir’s expertise against spin and he can be devastating if he gets going. India would be looking to play both Gambhir and Sehwag in both the warm up games and would hope to see them scoring some runs. Gambhir has an impressive T20 record and would want to turn it on at the biggest scene. Lakshmipathy Balaji makes a comeback to the Indian team after 5 years. He would most probably be fighting for the one spot with Dinda in the X1. Balaji makes the squad due to his brilliant performance in the IPL 2012 where he was extremely economical and also picked up wickets for KKR. It will be interesting to see how he goes in this tournament. A good performance in the World Cup might give him a decent run in the Indian team again. Manoj Tiwary and Ajinkya Rahane will be the rookies for the Indian team this tournament. Extremely talented neither of them will be first choice pick in the X1. Rahane impressed one and all with his brilliant batting as an opener in England and Tiwary has done extremely well in the middle order in the limited opportunities he has received in the ODI team. Tiwary will be battling for one spot with Rohit Sharma and Tiwary has a difficult task of competing with Sehwag and Gambhir. Ravichandran Ashwin and Rohit Sharma form the rest of the squad who could make a huge impact. Both these players are extremely talented and have done very well for their franchises in the IPL. For Rohit Sharma though this might be the make or break tournament and would want to make solid contributions to the Indian middle order. Ravichandran Ashwin’s case is pretty confusing as he is India’s premier spinner in ODI’s and his struggle in T20I’s is rather perplexing. He has done extremely well in the IPL for CSK and it will one be a matter of time before he translates that success to T20I’s. For now though I guess Harbhajan might beat him to make the final X1 considering his experience and current form. MS Dhoni will be India’s captain and wicket keeper. He has struggled to make an impact in this format with the bat and would want to correct the same. His leadership in the shorter format this year has been brilliant and his calm demeanor on the field will be extremely important in a high profile tournament like this. India has a very balanced squad and has a great chance of repeating 2007 success. So I wish the team best of luck and I hope they put up a good show in the World T20.